Objective: To determine rates of suicide associated with pregnancy by the type of pregnancy. Design: Register linkage study. Information on suicides in women of reproductive age was linked with the Finnish birth, abortion, and hospital discharge registers to find out how many women who committed suicide had had a completed pregnancy during her last year of life. Setting: Nationwide data from Finland. Subjects: Women who committed suicide in 1987–94. Results: There were 73 suicides associated with pregnancy, representing 5.4% of all suicides in women in this age group. The mean annual suicide rate was 11.3 per 100 000. The suicide rate associated with birth was significantly lower (5.9) and the rates associated with miscarriage (18.1) and induced abortion (34.7) were significantly higher than in the population. The risk associated with birth was higher among teenagers and that associated with abortion was increased in all age groups. Women who had committed a suicide tended to come from lower social classes and were more likely to be unmarried than other women who had had a completed pregnancy. Conclusions: The increased risk of suicide after an induced abortion indicates either common risk factors for both or harmful effects of induced abortion on mental health. We determined the incidence of suicides up to one year after the end of a pregnancy by using national health registers. We analysed suicide rates by the type of pregnancy (birth, induced abortion, or miscarriage) and by background characteristics of the mothers. Information on all deaths (n=9192) of women of childbearing age (15–49 years) in Finland in 1987–94 was extracted from the register of death certificates. Of these, 1347 had suicide as the main cause of death. No death had suicide as a contributing cause. The suicides were linked to the medical birth register (519 139 births in 1987–94), to the abortion register (117 139 abortions in 1986–94), and to the hospital discharge register (9 881 254 discharges in 1986–94) by using the mother's unique identification number to find evidence of termination of a pregnancy in the year before her death. The follow up period of one year was chosen according to the current definition of late maternal death.12 We found 73 suicides associated with pregnancy. Ten violent and 16 non-violent deaths with unclear cause and 55 accidents associated with pregnancy were not included in the analysis. The death certificate register, collected by Statistics Finland, is based on death certificates written by physicians. All the death certificates are checked by forensic specialists and by medical experts at Statistics Finland. Information on age, cause of death, residence, and occupation (in 1987) was gathered from the death certificates. The Finnish Hospital Discharge Register gave information on all miscarriages (International Classification of Diseases, ninth revision, codes 630–632, 634, and 637) and extrauterine pregnancies (code 633) treated in hospitals.15 In 1986, data on 5% of all admissions to hospital were missing, but 99% of admissions for mental disorders and all admissions related to pregnancy, childbirth, or puerperium were reported correctly.15 Information on hospital admissions and diagnoses was collected from this register. Because the number of extrauterine pregnancies was low they were combined with miscarriages. If a woman had been pregnant when she committed suicide the case could have been found in our data only if she was admitted to hospital at some time during pregnancy or if the pregnancy was mentioned in the death certificate. As no such cases were found, suicides during pregnancy were not included in our analysis. Suicides occurring within a given year were calculated per 100 000 births, abortions, and miscarriages by age groups. The annual suicide rate per 100 000 women in the age group 15–49 years and in each age group was used as a reference.16 The risks of suicide by the outcome of pregnancy were compared with odds ratios. Differences in timing of the suicide and socioeconomical differences were tested with 2 test. Table 1 gives details of Finnish women who were pregnant during the study period. Among the women of childbearing age 1347 suicides represented 15% of all deaths. In the 73 suicides associated with pregnancy in our data information on outcome of pregnancy was mentioned in only 11% of the death certificates. Two suicides were connected with infanticide, and one suicide was connected with a preterm birth resulting in a neonatal death. In total, 30 suicides were committed after women gave birth (42%), 29 after an abortion (40%), and 14 after a miscarriage (19%), of which two were after an extrauterine pregnancy. The risk of suicide was at its highest during the two first months after the end of pregnancy (table 3). For each pregnancy the risk of a suicide was 11 per 100 000 ended pregnancies. This risk was highest in the age group 35–39 and lowest in age group 30–34. Among younger women, who overall had a lower risk of suicide but higher rates of pregnancy, suicides associated with pregnancy were proportionally more common. The suicide rate associated with birth was 5.9 per 100 000 births and for associated abortions was 34.7 per 100 000 abortions, giving an odds ratio of 5.9 compared with births (95% confidence interval 3.6 to 9.9). The suicide rate associated with miscarriages was 18.1 (3.3; 1.8 to 6.3). Among women aged less than 20 years, the suicide rates both after a birth and after an abortion were higher than in the same age group in the general population (table 4, figure 1). In the age group 20–34 the rate of suicide associated with birth was lower than the total suicide rate and the rate associated with abortions and miscarriage. After the age 35, the suicide rate increased for abortions. The same was true for miscarriages in the age group 40–49. In 63% (46) of all suicides associated with pregnancy women were living in urban areas. This equals the proportion of all women giving birth, but it is smaller than the proportion who have abortions (74%; P=0.09). The stated reasons for the abortion in suicide cases did not differ from those for all abortions; over 80% were performed because of social reasons. In our data on suicide no abortion was performed for fetal abnormality. Six per cent of women who gave birth were single and 1% divorced, but among women who committed suicide 19% were single (P=0.001) and 7% divorced (P<0.001). For suicides after an abortion the proportion of unmarried (that is, single or cohabiting) women was 41% compared with 62% of all women who had had an abortion (P=0.011). The proportion of divorced women, however, was reversed: 24% compared with 10% (P=0.004). In this study information from death certificates was linked with national health registers to find out the recent reproductive history of women of childbearing age who had committed suicide. In only 11% of suicides was an ended pregnancy mentioned in the death certificate. This shows that the data linkage was necessary to get complete information. Our data showed that the suicide rate associated with birth was half of the general suicide rate in women aged 15–49. This suggests that childbearing prevents suicide or that women capable of giving birth are not at high risk for suicide. The only exception might be teenage mothers, whose suicide rate associated with birth was three times the general rate in this age group. This is, however, a tentative finding because of small numbers. We were not able to assess an exact suicide rate after miscarriage because only those women who were admitted to hospital for miscarriage are registered. Our estimate is unbiased if we assume that the site of care is not correlated to the risk of suicide. The suicide rate was found to be slightly higher than the general suicide rate and higher than the rate after a birth. Our data suggest that miscarriage is not as important a risk factor as abortion but clearly more important than birth. A literature review for years 1943–80 showed that 1.8% of women who committed suicide and were of childbearing age were pregnant.9 If this figure were true now in Finland, the number of women committing suicide while pregnant would be 24, and a quarter of cases would be missing from our data, which included only completed pregnancies. Low social class and poor social support have been connected with risk factors for suicide after birth. The risk for postnatal depression is greater for women with low income or with occupational instability,20 21 and puerperal psychoses are more common among young mothers and women with poor social support.5 Social class has also been found to be associated with all mental disorders after an abortion.19 22 Data from the abortion register showed that women in the lowest social class were highly over-represented among women who committed suicide. We did not, however, have complete information on social class in our data. No control group for social class after birth and miscarriage and for the general population was available. In addition, the social class was based only on the mother's occupation. The relation between suicide, mental disorders, life events, social class, and social support is a complex one.23 Abortion might mean a selection of women at higher risk for suicide because of reasons like depression. Another explanation for the higher suicide rate after an abortion could be low social class, low social support, and previous life events or that abortion is chosen by women who are at higher risk for suicide because of other reasons. Increased risk for a suicide after an induced abortion can, besides indicating common risk factors for both, result from a negative effect of induced abortion on mental wellbeing. With our data, however, it was not possible to study the causality more carefully. Our data clearly show, however, that women who have experienced an abortion have an increased risk of suicide, which should be taken into account in the prevention of such deaths. Funding National Research and Development Centre for Welfare and Health (Stakes). Early identification of maternal depression as a strategy in the prevention of child abuse.Child Abuse Neglect 1992;16:345–58. Missing voices. The experience of motherhood. Oxford: Oxford University Press, 1994.
. A controlled study of the onset, duration and prevalence of postnatal depression.Br J Psychiatry 1993;163:27–31. Psychiatric disorders in women from an Edinburgh community: associations with demographic factors.Br J Psychiatry 1983;142:238–46. The psychological complications of therapeutic abortion.Br J Psychiatry 1992;160:742–9. Suicide during pregnancy and in the first postnatal year.BMJ 1991;302:137–40. 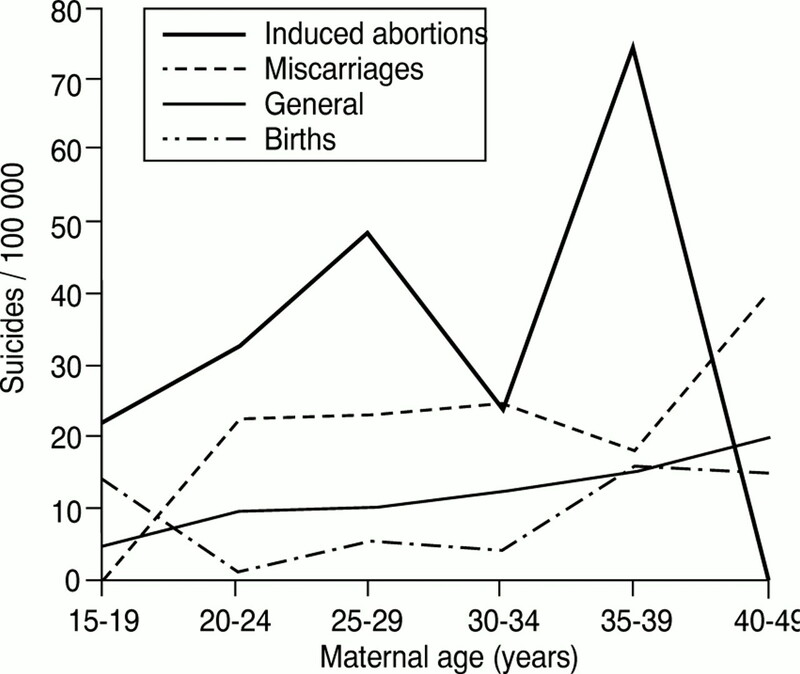 Psychological factors in abortion.Am Psychol 1992;47:1194–204. Psychological aspects of early pregnancy loss. In: Huisjes HJ, Lind T, eds.Early pregnancy failure. Clinical obstetrics and gynaecology. London: Churchill Livingstone, 1990:212–23. Overview of demographic and statistical factors. In: Kleiner GJ, Markus Greston.Suicide in pregnancy. London: PSG, 1984:23–40. Reasons for the under-reporting of maternal mortality in France, as indicated by a survey of all deaths among women of childbearing age.Int J Epidemiol 1991;20:717–21. Maternal mortality in Sweden 1980–1988.Obstet Gynecol 1994;84:240–4. World Health Organisation.International statistical classification of diseases and related health problems. 10th revision. Vol 1. Geneva: World Health Organisation, 1992. Data quality after re-structuring a nationwide medical birth registry.Scan J Soc Med 1995;23:75–80. Declining induced abortion rate in Finland: data-quality of the abortion register.Int J Epidemiol 1996;2:376–80. Accuracy of data on diagnoses, procedures and accidents in the Finnish hospital discharge register.Int J Health Sciences 1991;2:15–21. Suicide in Helsinki.An epidemiological and social psychiatric study of suicides in Helsinki in 1960–1961 and 1970–1971. Helsinki: Psychiatria Fennica, 1977. World Health Organisation.World health statistics annual 1994. Geneva: World Health Organisation, 1995. Psychological distress in pregnancy and preterm delivery.BMJ 1993;307:234–8. Social adversity and perinatal complications: their relation to postnatal depression.BMJ 1989;298:1073–4. Childbirth: life event or start of a long-term difficulty? Further data from the Stoke on Trent controlled study of postnatal depression.Br J Psychiatry 1995;166:595–600. Psychosocial consequences of therapeutic abortion. King's termination study III.Br J Psychiatry 1976;128:74–9. Social factors in suicide.Br J Psychiatry 1995;167:747–53.